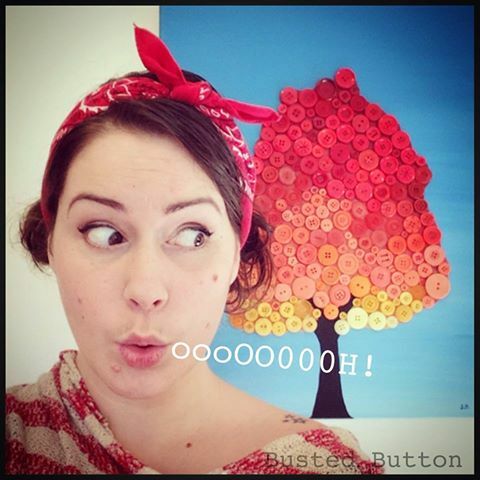 Next up in our string of giveaways is Dot from Busted Button! 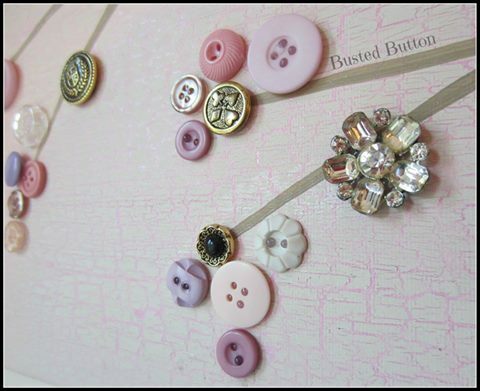 According to her Facebook page, Busted Button is “Where Creativity and A.D.D. meet…on a blind date…under a bridge…and make a baby.” Seriously, this woman is hilarious as well as talented. 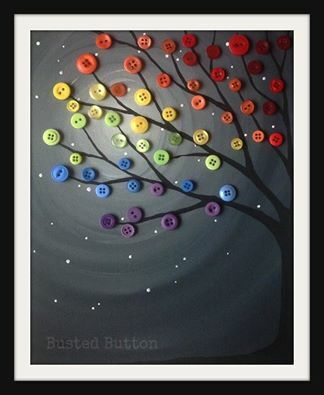 I’m sure you can guess by the name of her shop that she has a thing for buttons. She works them into her art, whether it’s in the form of jewelry, paintings or even handbags! She posts tons of tutorials and hilarious quotes and she’s amazing at promoting other artists she admires. According to Dot she started doing macramé with her umbilical cord, and I really wouldn’t be surprised. She comes from a large artistically talented family so she’s been painting the walls since she mastered the pincer grasp. When she was in grade 5 she and her sister started selling friendship bracelets. They invested their profits into the creation of a game with pompoms and magnets, which they also sold until their teacher told them to take their venture elsewhere. 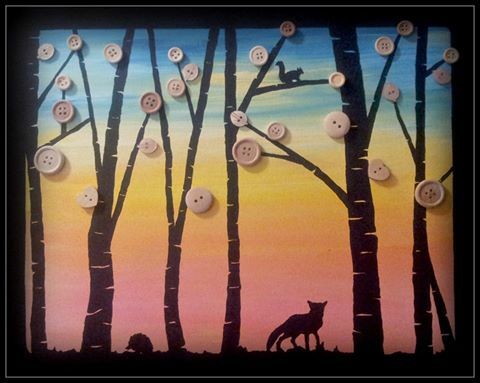 As an adult she decided to stay at home to care for her children and anyone who does that knows they need an outlet to keep them sane, for her it was… well… buttons! Dot has 5 kids aged 2-10 and she homeschools two of them. Her 7 and 9 year old boys have autism so she has a very busy and intense family life. Luckily for us this crazy lifestyle makes her even more determined to take some time out for herself to create. She usually does her creative work after the kids have gone to bed, where she proceeds to stay up until the wee hours. She also manages to sneak in the online stuff in between lessons, appointments, meals, and stubbed toes. According to Dot “it really helps me stay sane and connected to people who I love and who inspire me every day. And the fact that I can make a bit of extra cash really helps because of the extra expenses that come from raising kids with disabilities.” Dot wouldn’t admit to crafting naked but she did say that she’s had hot glue burns on her inner thigh… I think we can all draw our own conclusions. 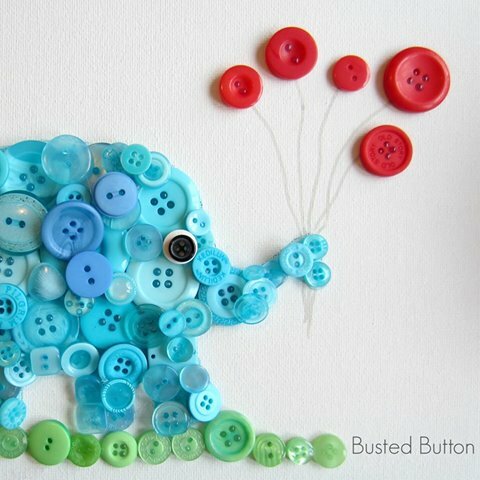 For the Crafty Bastards giveaway, Dot has generously agreed to donate a custom button elephant like the one below! How cute would this be in a kid’s room? Very, that’s how cute. Pop by the Crafty Bastards Facebook page on Monday for your chance to win! !